ASD Lighting LED edge-lit flat panel in white color, features aluminum housing and frosted translucent white PMMA lens. 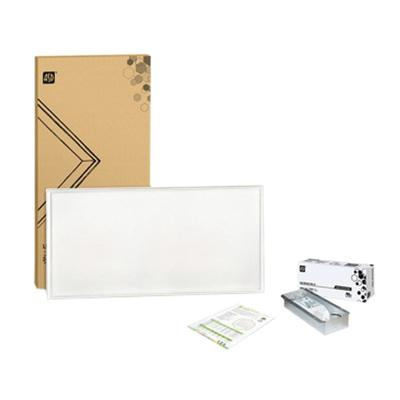 This LED flat panel in rectangular shape, uses 60-Watt LED that has voltage rating of 100 - 277-Volt AC and current rating of 1050-Milli-Amps. Lamp in the LED flat panel has color rendering index of 80 and color temperature rating of 4000K to ensure optimal light level in the surrounding. LED Lamp offers 4722-Lumens of bright light output. It measures 23.8-Inch x 47.8-Inch x 2.4-Inch. This recessed/suspended/surface mountable LED flat panel comes with 50000 hours of average life span and has efficacy of 85 LPW. This LED flat panel is ideal for indoor, offices, stores, schools, hospitals, hotels and airports. LED Flat panel is cULus listed, DLC and FCC certified.